I suppose the right thing to do, based on the current status of this book on Amazon (95% of the reviews are 5-Star), is to write a favorable, positive review and post it for everyone to read and enjoy. I'm a little late to the game so I feel no particular compulsion to be altogether favorable in my review. To be fair, however, I don't think Ms Wojo wrote this book with any man (aside from her husband) whatsoever in mind so it could be that she simply wasn't speaking to my version of the species. That's fine and at the heart of my review is that thought: the book simply did not speak to me as a man. There's nothing sexist or unfair about that assessment. Rather, just an honest evaluation of where I was with this book. On the other hand, sentences like this: Before you know it, the feeling of wanting to give up has saturated your spirit and you feel like you can't take even one more step. You have lost every ounce of strength in your mind, body, and spirit" seem to speak across the sexes and engulf us all in the pathos of her writing and I think, at times, she does a good job of remind all readers that God is available, that he understands us, and that he is consistent. The book is a very self-centered book and I don't mean that in a pejorative way. I simply mean that the book is about Ms Wojo and her life experiences: her joys, her sorrows, her marriage, her children, her faith, and her life. It is mixed with stories from the Bible and she is trying to understand her life in light of those stories she reads in the Bible. And although I have no use whatsoever for her particular 'use' of Scripture (stories generally pulled from context and applied to situations the Bible writers did not envision), I do appreciate the fact that the book is filled with more than an abundance of Scripture spread throughout the book. I would appreciate more context for those stories, but that's just a personal thing. The book is also very typically a book about the 'problems' of American Christians. I don't think this book will have much of an audience in poorer nations where Christians are actually suffering. However, it will appeal to many in the mainstream American church where Christians suffer from the pressures of pressure, fatigue, burnout, poopy diapers, grocery shopping, and child-rearing. I'm not at all discounting the struggles of Ms Wojo at all. Struggles they are; and real. But there is a sense in this book that much of what she has struggled with is uniquely American and could be solved as much by a trained secular psychologist. Again, I'm not discounting the real pain she has endured in her life. That's not my point, so please don't misunderstand the point I am making which is that while some folks may relate to her easily, I think there is also a lot who will not. Each chapter deals with some particular issue Ms Wojo has experienced in her life and she works hard to relate this to our Christian experience by blending stories, Scripture, quotes, and more into a narrative that explores feelings, and emotions and which eventually draws out some principles designed to guide us through the negativity often felt because of these experiences. At the end of each chapter readers will find "Pillars of Truth to Lean On", a bullet point list of Scriptures associated with the chapter's content. 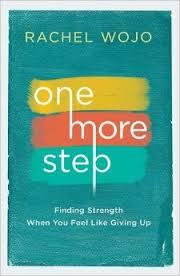 Finally, there are "Stepping Stones' at the end of the chapters which are coordinated with the One More Step journal. At the end of the book, readers will find Discussion Questions, some perfectly Tweetable block quotes, acknowledgements, a selection of hymn titles that guided the writing of the book, information relating to MPS, and end notes. Again, I am certain this book will find its way into the hands of someone who needs to read this book. Unfortunately, I wasn't one of those people. There's nothing particularly wrong with the book. I just didn't like it or find that it spoke to me where I am at. That doesn't mean it won't be helpful for others especially those going through difficult times of the loss of a child or or a parent or a child with a particular disability. At the end, she points them to Jesus: "Jesus not only heals broken hearts, but he also transforms broken hearts into his hands and feet that carry his love and share it with others" (192). That's enough for anyone and would have been a fantastic opening salvo. Disclaimer: I was provided a free copy of this book via the Waterbrook Multnomah blogger review program in exchange for my fair and unbiased review.